Before yeast was commercially available, people made sourdough bread by capturing wild yeasts from the air in a process called fermentation. Fermentation is gaining a lot of attention lately because of all the health benefits including making food more easily digestible, the presence of good bacteria (think yogurt), etc. FUN FACT: Alaskan Prospectors used to carry sourdough starter with them because they didn’t know when they would be able to buy supplies. I’ve been wanting to try my hand at fermentation and I decided that sourdough starter would be a good place to start. This recipe uses store-bought yeast, but you can find recipes using only flour and water if you are feeling adventurous. Step 2: Cover and store in warm, dry place for 4 days or until it smells sour. Step 3: Store in plastic airtight container in the refrigerator until ready to use. TO KEEP STARTER: Once per week beat in 1 tbsp all-purpose flour and 1 tbsp warm water until smooth. Let stand overnight or until bubbly. Cover and refrigerate until ready to use. TO REPLENISH STARTER: For each 1 1/3 cups of starter used, add 1 1/3 cup all-purpose flour and 1 1/3 cup warm water back in beating until smooth. Cover and let stand overnight or until bubbly. Refrigerate until ready to use. I’ve since made a few loaves of sourdough bread using this recipe which were AMAZING. They didn’t taste as sour as I thought they would though. Have you ever made sourdough starter or any other fermented food? 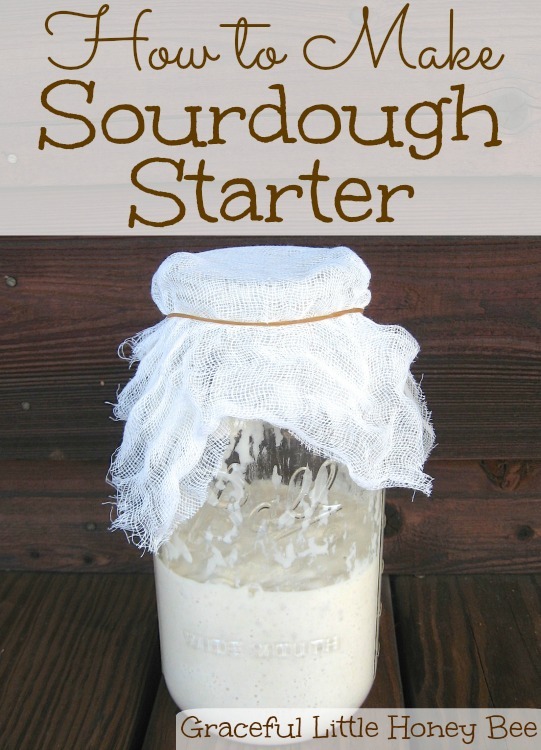 If not, do you think you would ever try making your own sourdough starter? I’d love to know! Cover and store in warm, dry place for 4 days or until it smells sour. Store in plastic airtight container in the refrigerator until ready to use. I attempted to make a sourdough starter last year, and after a week of our kitchen smelling like stinky feet I gave up and threw it all out. :-) Maybe I should have given it more time, but it was stinky! I will have to try this one with yeast as the starter. Thanks for sharing! Not sure stinky feet is the right smell. It should be yeasty and slightly sour, like sourdough bread. I've never tried this but it's something that has always been in the back of my mind. I enjoy your site. Following on g+ and bloglovin. This is pinned. Thanks! I've heard it could develop an "off" smell and taste, but you could always try! This has been on my to do list-thanks for sharing at the HomeAcre Hop. I have been wanting to start making more fermented foods as well. This is very helpful! We currently make kefir and sauerkraut. I've been wanting to make sauerkraut as well. I'm sure I'll get to it sometime soon! Hi, I used to have the starter yrs. ago, and I don't recall having to use yeast.....my sis-in-law gave me a starter and as she called it I had to feed it every week, I would add certain things to it, can't remember but I know it was not yeast....and I used to make the best rolls out of it...she would make cakes, I never tried that....do you know of something like this ???? I used the yeast to get it going, but to keep it I add 1 tbsp warm water and 1 tbsp flour each week. I use to make a friendship bread with it, but that was years ago and I can't remember anything that went in to it but cinnamon and sugar :( it was great all my friends did it to. We passed it around a lot. Can you look on Pinterest? I've seen several friendship bread recipes over there. About the yeast- 2 1/4 what? I buy my yeast in the jar, not the packets. I guessing teaspoons? Thanks! Sorry about that it's 2 1/4 tsp. I haven't made sourdough in years! A lady from church gave me some starter soon after we were married and I made it some then but with just the two of us, we didn't go through bread very fast and I eventually gave it up. Her recipe took potato flakes and as I recall, was a bit more complicated than this too. But we do love sourdough bread and I've been thinking of trying it again! I followed this recipe to a T & my starter has a hard crust on top. What did I do wrong, & can I still use this one or do I need to start over? You may have used a jar that was too small and when it expanded it hit the cloth at the top and formed a crust. Mine did this too, but I removed it right away. I would remove the crust and see if your starter has a nice sour, yeasty smell to it. If not, I would throw it out and start over. Kept one for years and years as a kid growing up in Alaska. Missy, I came here from your 25 Old-Fashioned Recipes post. I'm an old hand at sourdough bread, made my starter from just flour and water (you can find the directions on my blog). I keep my starter in a half-pint jar in the refrigerator (no need to keep a huge quantity of it) and make sourdough bread twice a week. My husband is addicted to it. I figure even though I buy expensive organic flour I still save a few hundred dollars a year on bread. Your blog is lovely and I look forward to reading more. I use to make sour dough bread with the potatoes flakes. When you get tired of making bread or rolls make cinnamon & raisin bread or cinnamon rolls with pecans very good. I have heard that you have to live at a certain sea level for it to really get sour. That it why it's so popular in San Francisco. Interesting. I've never heard of that before. Never done this. Okay so I made the starter and its in the frig ready to go. I use some of it, so I will need to replace with flour and water. Then it says to let it sit for a while then refrigerate. So the whole thing comes out of the refrig then goes back in afterwards? I'd LOVE to start this. Growing up, this was always going around. We all called in friendship bread as we always shared the starter. When we give a starter to someone else, how do we give a part to them to start but not lose any for us? Thank you and I agree with you about certain things are a lost art. It's up to us to learn it and share with our children so they keep it up! Can't wait to try this, but I don't see directions for baking the bread with it. Can you tell me how to bake it, please. As Julie says, there's no recipe for baking bread using your sour dough recipe. What are the directions for baking the bread? Unfortunately, I don't have a sourdough recipe posted, but you should be able to search Pinterest sorry.